Ligni Work Station is a perfect solution for offices used by individuals as well as teams. Modern design combined with clever, practical solutions provides a great experience. In addition to that, a high number of configuration options allows you to find a perfect match for your interior design. Ligni desks are 800mm deep and are available in widths of 1400mm, 1600mm, 1800mm and 2000mm. Combine with a choice of pedestals and returns., all tops are fitted with two cable ports as standard, with optional cable trays and wire managed legs – angled or straight. Tops and optional modesty panels available in MFC or veneer, 3D MFC or PerfectSense finishes. Tops have an elegant thin profile and edge either to match or contrasting in Ply, the sides of the laminated Ply legs are offered in a wide choice of standard veneer and laminate finishes. Ligni workstations are 735mm high and are available in widths of 1400mm, 1600mm, 1800mm and 2000mm, all workstation tops are fitted with two desk-top cable ports and one storage top cable port as standard, with optional cable trays and wire managed legs – angled or straight. Cables can route from floor to desk top via a cable port in the lockable storage unit, tops and optional modesty panels available in MFC or veneer, 3D MFC or PerfectSense finishes. Tops have an elegant thin profile and edge either to match or contrasting in Ply, the sides of the laminated Ply legs are offered in a wide choice of veneer and laminates. Ligni Bench Desks offer a flexible and stylish solution for team working and other collaborative tasks. Modules are 1600mm deep and are available in widths of 1200mm, 1400mm, 1600mm and 1800mm. 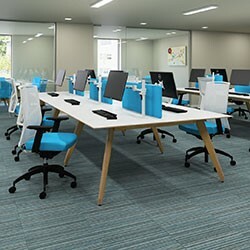 End modules and insert modules are combined to form bench desks of the desired length, all tops are fitted with four cable ports (two to serve each side of the bench) and may be centrally divided with fully upholstered PAD screens. The new Ligni Power Tower, with lift-off panel for convenient cable access, cable trays and wire managed legs are optional, tops available in MFC or veneer, 3D MFC or PerfectSense finishes, with an elegant thin profile and edges either to match or in contrasting in Ply. Ligni pedestals offer two or three drawer storage options with push-latch opening mechanisms. A 317mm wide narrow three drawer pedestal also available. Add an upholstered cushion to the two-drawer pedestal for an ad-hoc seating option. Ligni PAD Screens are fully upholstered screens to fit Ligni bench desks, providing privacy and division while maintaining collaborative openness, they are available in heights of 340mm (fixed and freestanding) and 465mm (fixed), screens are 26mm thick. Freestanding screens on two 120mm diameter circular feet available in Black, White, Slate or Zinc. Ligni offers four Desk-height Storage Units. Two have double doors, one has two pairs of double doors, and one has two single doors with drawers between. 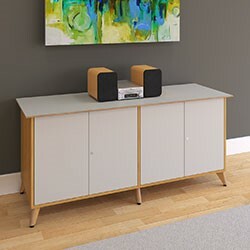 All feature flyover tops with thin edges to match Ligni tables, and feet in the same style and with the same finish options as table legs, light storage unit doors and drawers are flush-fitting with push-latch open/close. Option to add an integral fridge.